Six10® Adhesive gives you the strength and reliability of a two-part WEST SYSTEM epoxy with the convenience of a single part product. Six10 is dispensed with a standard caulking gun. Non-sagging Six10 bonds tenaciously to wood, metals, fiberglass and concrete. It cures in temperatures as low as 50°F. Working time is 42 minutes at 72°F. Cures to a solid in 5–6 hours and will take high loads in 24 hours. Cure time is faster at warm temperatures and slower in cool temperatures. The Six10 cartridge holds 190 ml of resin and hardener. 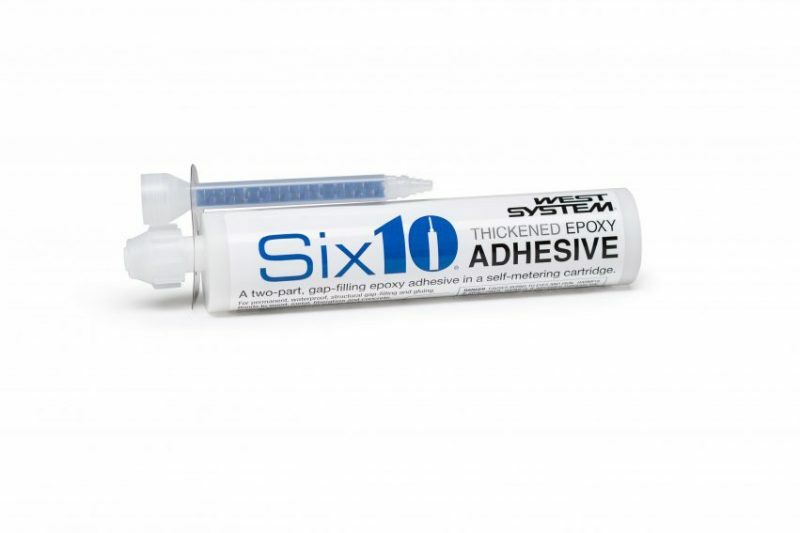 To use Six10 Adhesive, replace the retaining nut and plug on the West System Six10 dispensing cartridge with the 600 Static Mixer that comes attached to the cartridge. Dispense mixed 2-part epoxy adhesive using a standard caulking gun. The efficient internal geometry of the 600Mixer thoroughly blends resin and hardener in a short mixing length for good application control and a minimum of waste. Place high-strength, non-sagging epoxy exactly where it’s needed in less time and with no mess. Additional 600 Static Mixers are available in packages of two or twelve. For more information, see Understanding Six10 Physical Properties and Practical Tips for Using Six10.